Dhaka, Mar 9 (Just News): The Bangladesh Nationalist Party (BNP) on Friday alleged that law enforcers violated the Supreme Court's (SC's) directives by arresting one of its activists from a political programme without any warrant. 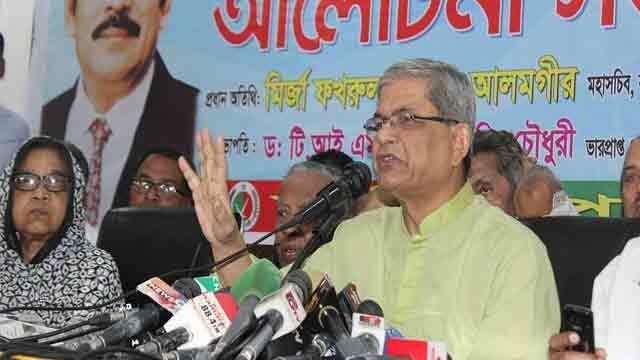 Speaking at a discussion, party secretary general Mirza Fakhrul Islam Alamgir also said the government's plan to hold the next national election keeping BNP chairperson Begum Khaleda Zia in jail is unrealistic. "I would like to express my anger and sorrow as I couldn't save a Chhatra Dal leader who tried to escape arrest holding me tight. The law enforcers swooped on our programme in front of the [National] Press Club and snatched him by tearing his clothes," he said. A faction of Jatiya Party (Zafar), arranged the programme at the National Press Club, demanding BNP chairperson Khaleda Zia's release from jail. On Thursday, police arrested JCD leader Mizanur Rahman Raj from BNP's sit-in programme in front of the National Press Club and foiled the event just 13 minutes before its scheduled conclusion. He said their chairperson has been convicted in a 'false' case 'unlawfully' to keep her, BNP and the 20-party alliance away from the next election. "Their main motive is to retain power without a competitive election." The BNP leader said Khaleda Zia is being deprived of her legal right of having bail due to the government's interference. He also alleged that the government is controlling the judiciary by establishing a one-party rule under a different cover.